We have introduced a common identifier mechanism to connect or map user collected data from pre-chat forms across multiple languages. For example, if your company collects data from a customer using a pre-chat form in multiple languages and uses this data to identify the customer or create a new record, the question label in the pre-chat form such as — Name in English, Nome in Italian, Nom in French can be mapped/connected using a common identifier. The identifier facilitates further processing of this information. Create identifiers for questions in the pre-chat form in one language. Log in to Configuration Manager and navigate to Chat Design. Edit an existing pre-chat form. Select a question and enter an identifier for the question. Note: You must use this identifier to connect the question replicated in other language forms. Repeat this for all questions on the form. Note: Identifier is not applicable to the chat language choice question. Click Next>> and then Save in the next screen. For pre-chat forms replicated in other languages, use the same identifiers for questions. 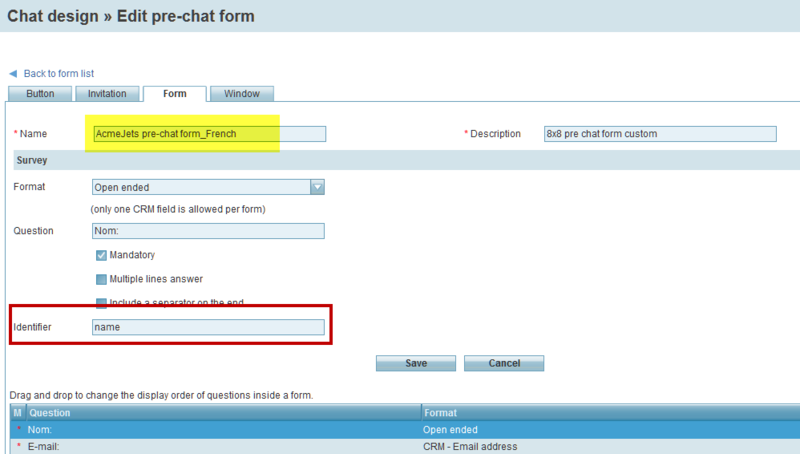 Select and open the replicated pre-chat form in another language from the list. 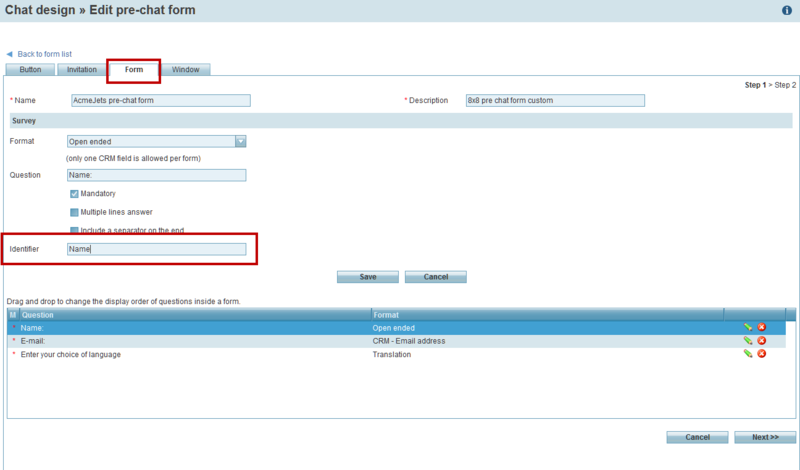 Copy and paste or enter the identifier for this question from the other form created in step 1. Repeat this for all questions. Create pre-chat forms in the desired languages. Create an identifier for questions in the pre-chat form in one language. Use the same identifier for questions across pre-chat forms replicated in other languages.